Everyone who knew Derek Pugh was very surprised when he announced his retirement and he would not be promoting speedway again after the 1993 season. He had promoted at Dudley Wood for 17 years and transformed the side. The highest position the Heathens attained before his promotion was 7th in the British League, by the time he retired only once had they been below 7th and they had won 20 Trophies including two league championships. It was a shock but hardly noticed by the general public. Les Pottinger and former rider Mike Gardner agreed to take over the promotion leaving Colin Pratt in charge once again. 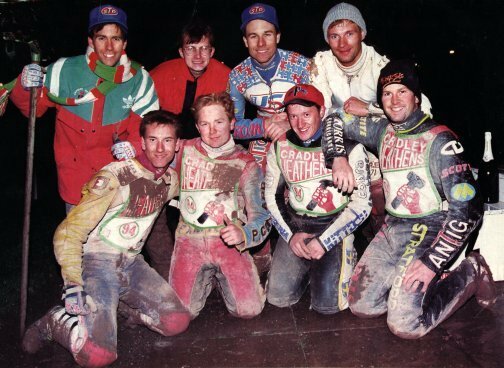 Colin signed Greg Hancock and Billy Hamill and met them at airport as they had a young unsigned American - Chris Manchester with them but he was told that Chris had all but signed for Wolverhampton, however he ended up at Belle Vue. The new points limit was set at 44 for 7 man teams and with better pay rates on offer Billy was first to sign followed by Morten Andersen, Scott Smith and Andy Grahame who had got a winter job in engineering but was allowed time off. He also acquired Dave Clarke from Oxford who had performed well at Dudley Wood in the past when riding for Coventry. Greg was made captain but the Heathens were still short of a third heatleader. Simon Cross fitted the bill and came out of his retirement at the last minute. It wasn't long before the injuries began, Andy Grahame was out early on and then in the match against Arena Essex Morten Andersen, Billy Hamill and David Clarke went hospital within minutes of each other. front row - Jonathan Forsgren, Scott Smith, Lance Sealey, Simon Cross. Andersen and Clarke were out for the rest of the season and the management moved quickly to sign Peter Nahlin the former World Under 21 Champion who rode so well that he was elected Rider of the Year by the supporters. He also announced that he didn't want to ride for anyone else but the Heathens. Another Swede, Jonathan Forsgren also joined the team and did quite well, showing a lot of potential. Cradley had lost too many points early on to have much of an impact on the league title, but showed their characteristic fighting spirit in the cup matches. In the fours they won all of their qualifying rounds fairly easily and went to Peterborough as one of the favourites but it was not their day, although Crossie and Nahlin were brilliant the Yanks had an off day and Cradley were well beaten. They rode very well in the Speedway Star sponsored KO Cup to reach the Final against the high flying Eastbourne Eagles, the first leg at Dudley Wood was rained off and the following day on the South Coast they took a pasting. 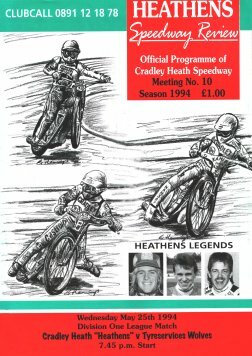 They had to run the home leg on one of Cradley's off nights to a much smaller crowd, although they won by two points it was not enough to win the cup. Individually Greg Hancock reached his second consecutive World Final but for a very poor last ride he could have been World Champion with 3 wins giving him 4th place behind Tony Rickardsson, Hans Nielsen and Craig Boyce in this the last one-off Final before being changed to a Grand Prix competition. Simon Cross 5, Justin Walker 1, (G)Steve Masters 1. Scott Smith 9, Billy Hamill 8, Justin Walker 4. Scott Smith 5, Justin Walker 1, Anthony Boyd 0.